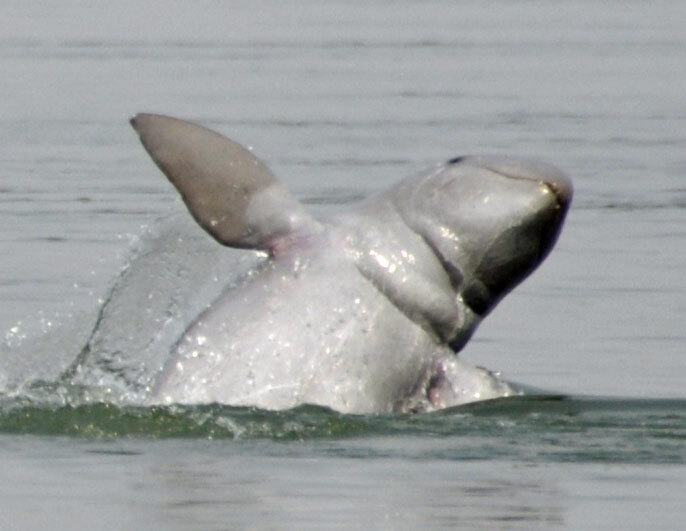 Two Mekong Irrawaddy dolphin calves have been spotted in the Mekong Flooded Forest Landscape in Kratie province, sparking off fresh hopes for the future of this species. Jumping Irrawaddy dolphin at Mekong river, Kampi, Kratié, Cambodia in 2011. Villages from the Prek Kreing village in Sambo district spotted the first calf on August 11th. It was believed to be two to three weeks old. The sighting was promptly reported to officials at WWF. The second calf was spotted two days later, at the Kampi deep pool 16 kilometres from Kratie town, by the locals and a WWF research team. It was believed to be just a few days old. “I am so happy to hear about the successful recruitment of the two new calves into the population,” said WWF-Cambodia Country Director Seng Teak. A WWF statement was issued on this sighting: “This is a high achievement compared to the same period last year (Jan.-Aug. 2016), when four dolphins died and only four were born. More than ever, there is hope to believe it is possible to reverse the trend of the Mekong Dolphin decline." Since 2004, this dolphin species has been listed as critically endangered, with only about 80 adults left in the Cambodian stretch of the Mekong River.